Wild: Approximately one meter long, the Archaeopteryx magnamilvum is a primarily tree-dwelling proto-bird. It avoids the ground as much as possible, preferring to stay in the safety of the trees, where few predators can reach it. Domesticated: While not large enough to bear the full weight of an adult human, Archaeopteryx still has great utility. Despite the creature’s inability to fly, its wings have sufficient strength to dramatically slow the rate of a person’s descent, if that person holds Archaeopteryx while airborne. Taming Archaeopteryx can be somewhat troublesome, though, as it refuses to eat the most common food sources, and glides to prospective safety at the first sign of any interloper. 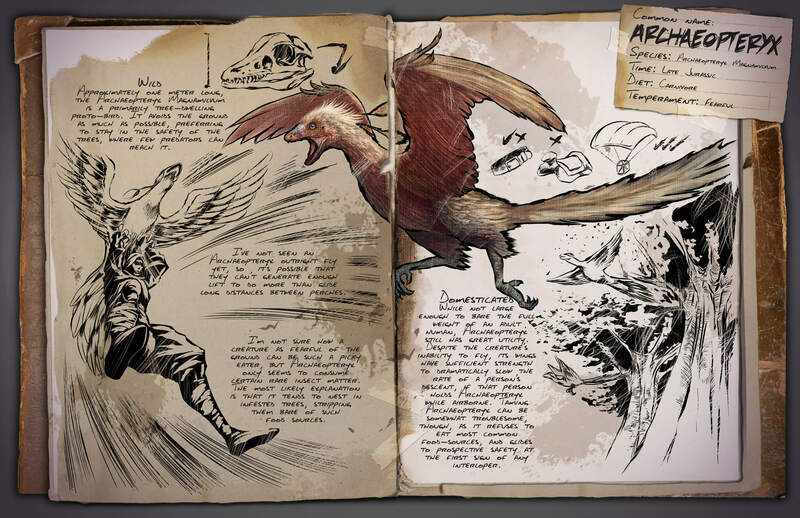 Known Information: I’ve not seen an Archaeopteryx outright fly yet, so it’s possible that they can’t generate enough lift to do more than glide long distances between perches. I’m not sure how a creature as fearful of the ground can be such a picky eater, but Archaeopteryx only seems to consume certain rare insect matter. The most likely explanation is that it tends to nest in infested trees, stripping them bare of such food sources. Previous Post: Patch v229 – What’s new? Next Post: Upcoming dinos preview – Giant Beaver, Dung Beetle, Terrorbird and more! Anyonw know when they are actually releasing this dino? It’s my favorite!